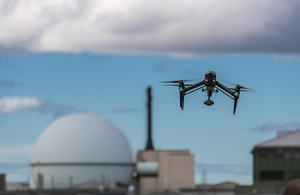 Dounreay is using drone technology at the site in Caithness, Scotland. The technology sees a camera mounted on an unmanned aerial vehicle to carry out tasks that would otherwise have been done by workers on platforms. Dounreay Site Restoration Ltd (DSRL), the company in charge of decommissioning the nuclear site, carries out around 50 building inspections each year - helping maintain buildings that play an important role in nuclear decommissioning, clean-up and waste management operations. The switch to using drones means around £100,000 worth of savings to the UK taxpayer, which can be used for other front-line decommissioning and hazard reduction work. John Moar, a senior electrical engineer at the site, is the brains behind the initiative and carried out research into the potential for using drones. Dounreay falls within a strictly enforced air exclusion zone and is protected by armed officers from the Civil Nuclear Constabulary. John undertook a Civil Aviation Authority course in order to secure an exemption from the no-fly zone, before the site bought a drone that was capable of carrying out the inspections for just £6,000. The drone paid for itself on its first outing to inspect two 20-metre high ventilation stacks. Previously, this work would have needed scaffolding and a hired mobile platform, costing thousands of pounds a week. "The team were delighted at the quality and detail of the images and how easy and safe it was to get them,” said John. "Clearly, there are very strict rules in place to protect the safety and security of nuclear sites, so we had to follow a stringent and detailed process to get all required agreements for using drones at Dounreay. "The potential for using drones doesn’t stop here, I can see how we’d use similar technology for things like 3D modelling and environmental surveys."